Girls don’t come in one-size-fits-all. Learning shouldn’t either. In the Collaborative Classroom, every girl discovers how far she can go, and then gets helped to go a little farther. Teachers work closely in partnership to develop rigorous, high quality and engaging curriculum that challenges every student to achieve her full potential. Ensuring that each girl has a strong foundation of core knowledge, essential skills and an understanding of herself as a learner is key to what we do. Teachers in the Collaborative Classroom work as a team to provide the type of feedback and individual instruction necessary in order for each learner to achieve her personal best. 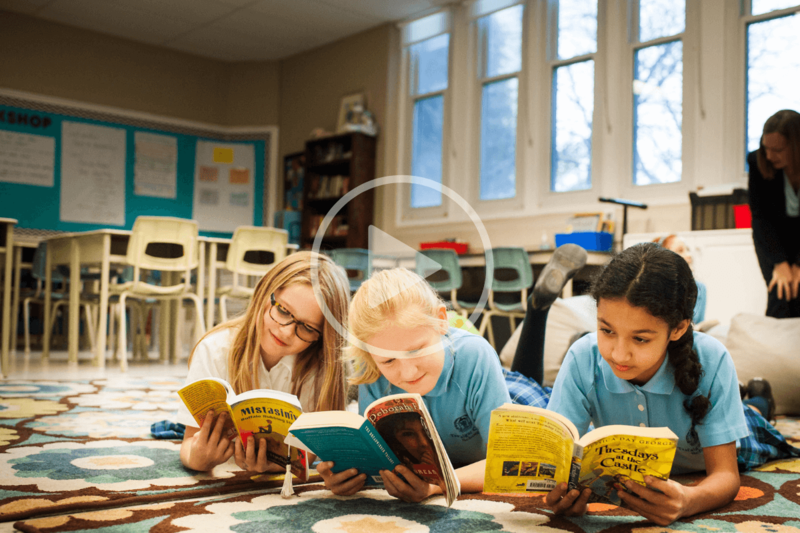 Combine three skilled teachers with three excited classes and you’ve got the chance to create collaborative learning experiences that meet the needs of all learners. Throw in the support of two dedicated Directors and a skilled Program & Instructional Coach, and suddenly each girl can thrive. An integrated program focusing on real-world problems combined with research-based best practice in teaching ignites each girl’s love of learning. Evidence shows that inquiry-based, collaborative approaches benefit students in learning important twenty-first-century skills, such as the ability to work in teams, solve complex problems, and apply knowledge from one lesson to others. The research suggests that inquiry-based lessons and meaningful group work can be challenging to implement. They require changes in curriculum, instruction, and assessment practices — changes that are often new for teachers and students. Inquiry-based instruction can help teachers deepen their repertoire for connecting with their peers and students in new and meaningful ways. That’s powerful teaching and learning — for students and teachers alike. Students learn more deeply when they can apply classroom-gathered knowledge to real-world problems, and when they take part in projects that require sustained engagement and collaboration. Active-learning practices have a more significant impact on student performance than any other variable, including student background and prior achievement. Students are most successful when they are taught how to learn as well as what to learn.